DJ Mark has been performing on Cape Town dance floors for more than a decade. Over this time, he’s crafted his skills and delivers top-notch sets irrespective of his placement on the lineup. We had a chat with the Expo Records artist, to tell us a little bit about his career, the Cape Town psytrance scene, and more. Howzit Mark! To kick things off, tell me a bit about yourself and your introduction to Psytrance? Well, about 15 years ago, trance was big in the Deep South. Parties were thrown in underground venues all along the South Peninsula. My first party was at an industrial warehouse in Fish Eagle Park in 1998, and that led me to other productions including Alien Safari’s infamous Grassy Patch parties, and the ‘Soetwater’ venue. In December of 1999, I went to my first Vortex. It was an island party – where the dance floor was on a man-made island surrounded by water. This was my first introduction to a large-scale production, with a full sound and lighting rig. I was 17 years old at the time, and like a kid in a candy store, I met people from all over the world who had travelled to South Africa for the Vortex/Etnica party in 2000. I suddenly understood how big the scene was – much greater than what I thought just existed in my ‘backyard’. New Years 2000 was the next step – over 10 000 people, the majority of them foreigners. It was one of the most insane weeks of my life. Infected Mushroom, Tristan, Tim Schuldt, Koxbox and Hallucinogen, to name but a few. I was mind blown. The rain didn’t stop the dance floor – I was sold – hook, line and sinker. I bought my first trance album at that Millennium Party. It was Spirit Zone – Tales from the Forest. I have never looked back (or left or right) since then. With regards to the alias, [laughs] I get asked this question a lot. My most honest answer is that I have found a way to rip off every name I have come up with. They all sound cool for a while until you find a way to make it sound stupid. A name that I really started to enjoy and wish I had used is Marked. I still play around with the idea a lot, but I have kind of developed my name as DJ Mark already. But who knows, maybe one day I’ll start using it! 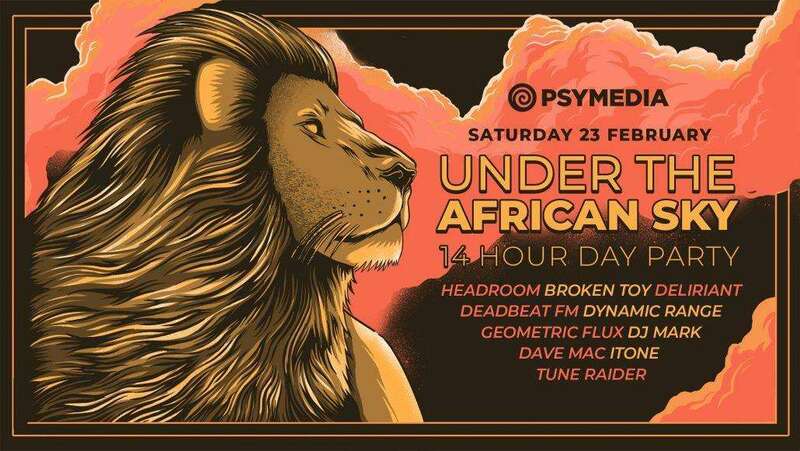 What positive changes in the Cape Town psytrance scene have you seen since you started attending and performing? There are a lot of positive changes in the scene, I don’t like to get stuck on how it has changed and what negative things have come through. It has changed organically and we need to concentrate on the positivity in that. For me the biggest positive change can be seen in bigger budgets, allowing festival owners the opportunity to push the boundaries. The productions are bigger and better. We are treated to amazing facilities, as well as amazing sound and light rigs. Shade and water on the dance floor were not always a feature, let alone toilets! We are privileged to see décor by unbelievably talented artists, local and from abroad. This brings an entirely new dimension to the party experience and has only been made possible by the expansion of the scene. Your sets seamlessly blend old and new school tracks. Do you think some artists are too quick to play only charting tracks whilst forgetting old gems? Oh yes, for sure. There was a noticeable change in music from about 2006. I think there are plenty of tracks that were way ahead of their time. Of course, playing current tunes is always important, but I’m not stuck on when tracks are released. If they are good enough, I’ll play them. There are new people coming to parties all the time and a track is only as old as the first time you heard it. So yes, for some maybe they get stuck on it not being current, but I try to play for everyone on the dance floor and old tracks often bring the biggest smiles. You currently represent Expo Records. Why did you feel they were a label you wanted to represent? Grant (Dynamic Range), the head honcho at Expo Records approached me with an idea which seemed well thought out. I’ve been contacted by other people in the past to consider joining their label, but nobody ever approached me with such a solid plan that I totally agreed with. His idea was to make waves with the comeback of psychedelic music. That and the fact that it was a South African label sold me. As a DJ over the past decade, is it possible to still learn new techniques and tricks? I have been learning since I started and am still learning now. DJ Bruce inspired me and helped me out with music in the beginning. From there I slowly started to develop into my own style and my own way of mixing. From two ‘Discman’ and a cheap small mixer in the corner of my bedroom, I moved onto CDJ’s where I stayed for many years learning and trying new things as the technology developed. In 2012 I made a difficult decision to move forward with technology onto a laptop with Traktor. The possibilities there are endless with loads more to do – hundreds of effects, looping, crazy cue options, and the list goes on and on. Why was it a hard decision? Is there a negative stigma attached? Everyone has different views on a laptop, and yes there can be a negative stigma to it because of the ‘sync’ button. But, as I said earlier, anyone can learn how to mix, and DJing isn’t only about mixing tracks together. I have proved that I can mix and now I am after things like sound quality and effects. I reached a level on the CDJs where I found myself finding a mix in about 10 seconds then standing there doing nothing but looking good [laughs]. I started buying little synths and things to keep me occupied, which meant a lot of plugging in before a gig, so moving to a laptop gave me all the bells and whistles without lugging a whole lot of gear around. I love analog EQ, and I don’t use a controller with a mixer in it. I still use the analog mixer so moving to laptop only replaced the CDJs. Your sets times have varied from party to party. Do you have a favourite time of day to play? I don’t really have a favorite time, but I thrive on transition sets. I like the challenge of a natural progression from either lighter music into the heavier stuff at night, or vice versa in the day. I go through phases and I guess it changes from party to party, production to production. I have really been enjoying the daytime Psytrance sets this season. I also enjoy the night time because I’m a sucker for the lighting and the visuals, they add to the tracks and seem to give them much more power because there is so much more ‘stimulation’ going on. Does anything about the growth of the scene, including the increased competition [as a DJ] make you want to take a step back, or does it push you to become better? Oh yes, there are plenty of people that can mix and play music – that’s always a bit of a threat, but saying that there is definitely an art to playing tunes and understanding how to build a set and create the flow that a trance set is supposed to be all about – the journey of the set, which comes from experience. I don’t pre-plan my sets which allow me more versatility when reading the crowd, if they don’t respond to a certain type of tune I can easily move forward in a different direction. I have also been fortunate enough to get a good couple of hook ups to getting pre-released tracks which is awesome as I am now able to play unheard tunes on the dance floor. Is it important to attend parties, even when you don’t play? You need to stay current inside the parties as well as outside. Being there helps me understand where our scene is ‘at’ – that’s something I’m never going to get from just following Beatport’s top 100. Thanks for the interview. Anything to add before we finish off? Thanks Psymedia for your time, and please go and check out the Expo Records releases for some quality psychedelic music from around the globe.